This Mass Book contains the basic responses for every Holy Mass. 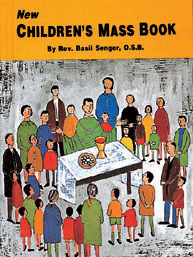 Enables children to take a more active part in the Mass by offering short explanations of the various parts of the Mass. Easy to follow, it is ideal for First Communicants and all young children. Contact us for quantity discounts. All items are F.O.B. factory. Prices are subject to revision without notice, please contact us to confirm current price. Size: 4 1/8 x 5 1/2"